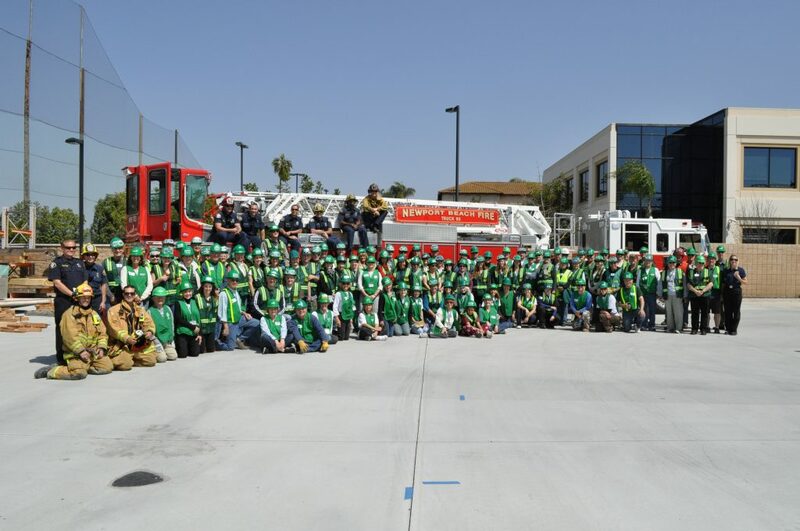 The very first Newport Beach Community Emergency Response Team graduating class in 1999 (left) and the recent spring 2018 CERT class. 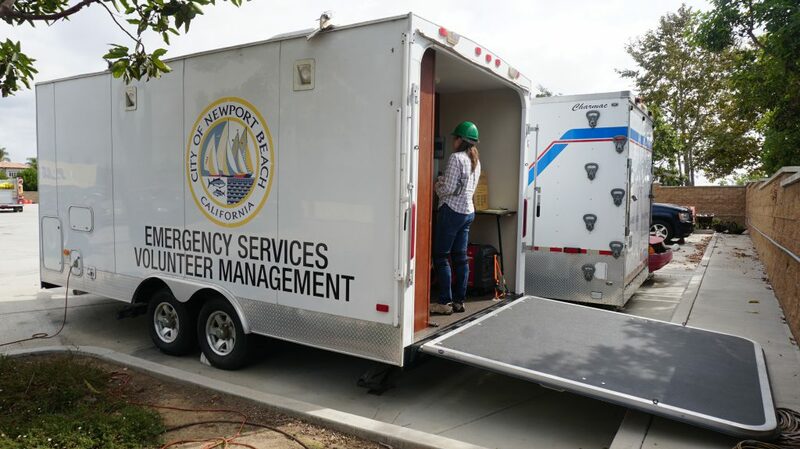 For the past 20 years, Newport Beach Community Emergency Response Team members have been training, preparing, and teaching, in case of a disaster. 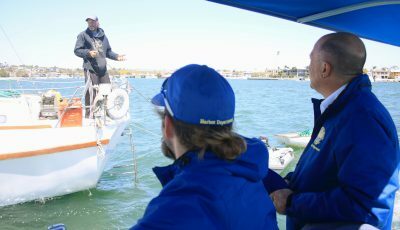 Life Safety Specialist Matt Brisbois, who has headed up the program since 2006, said the program has evolved over the years. “The program has grown exponentially,” Brisbois said. Both current fire and lifeguard chiefs, Chip Duncan and Mike Halphide, respectively, were on the original committee and taught the first classes 20 years ago. “Looking back at our CERT program, I’m really, really proud of where it is today,” Duncan said. He thanked all the volunteers, everyone who has taken the training over the years. 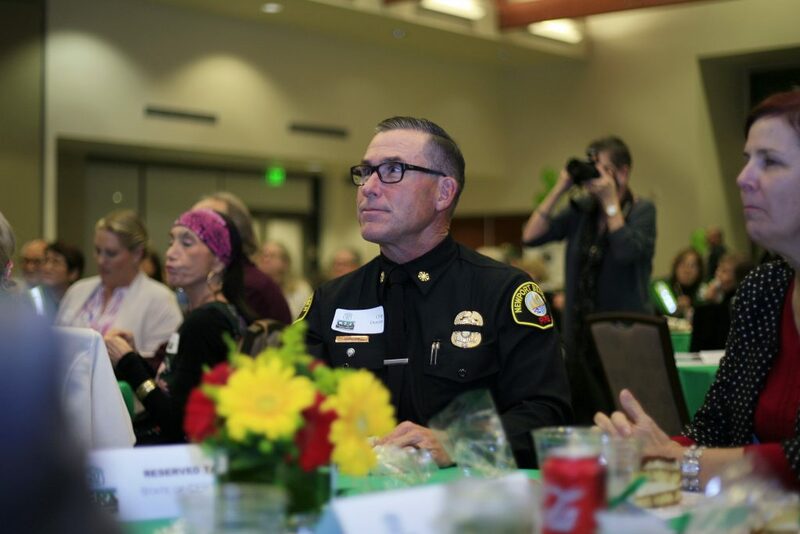 Duncan told the crowd of about 125 people at the annual State of CERT banquet Wednesday that they have made Newport Beach a better place. 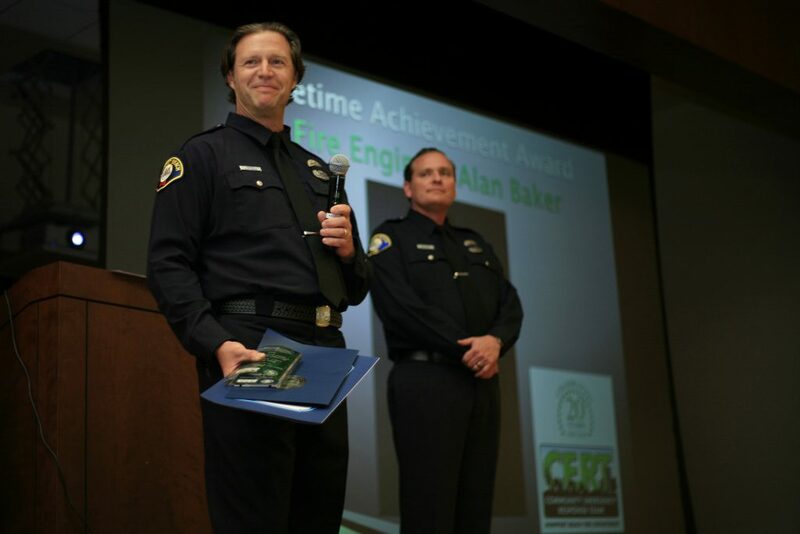 Newport Beach CERT instructor and NBFD fire engineer Alan Baker speaks at the banquet Wednesday after receiving his Lifetime Achievement Award. Another NBFD instructor, fire engineer Alan Baker, has taught in every single program over the past two decades. On Wednesday, Baker earned the program’s Lifetime Achievement Award. “It’s come full circle in our department,” Brisbois said. There have been some big milestones in the program’s history. Around 2007, the program started volunteer led neighborhood organization, becoming a model for preparedness. 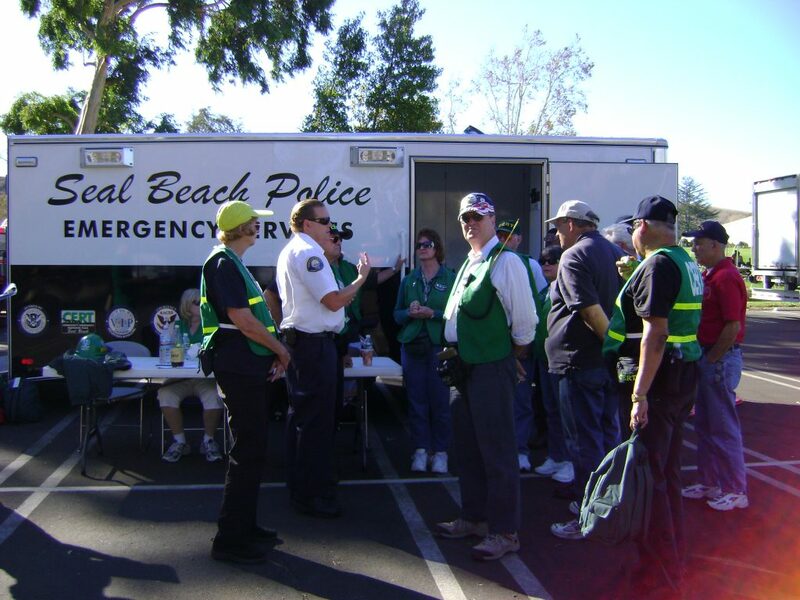 Newport Beach CERT was awarded with the 2012 FEMA Individual and Community Preparedness award for Outstanding CERT program initiatives. Brisbois was recognized as a 2013 White House Champion of Change. The concept went global in 2017 when Brisbois joined a state delegation on a trip to China to teach the CERT model. Mayor Diane Dixon also thanked the NBFD instructors and program volunteers, commenting on their dedication to keep residents engaged and the city safe. “It’s an amazing group of community volunteers,” Dixon said. She went over some statistics, including that the Newport Beach CERT has had 77 programs over the last 20 years (Brisbois as the program manager for 61 of those) and certified more than 2,000 participants. It is one of the largest programs in the country, she noted. Since 2011, volunteers have contributed more than 83,000 hours. 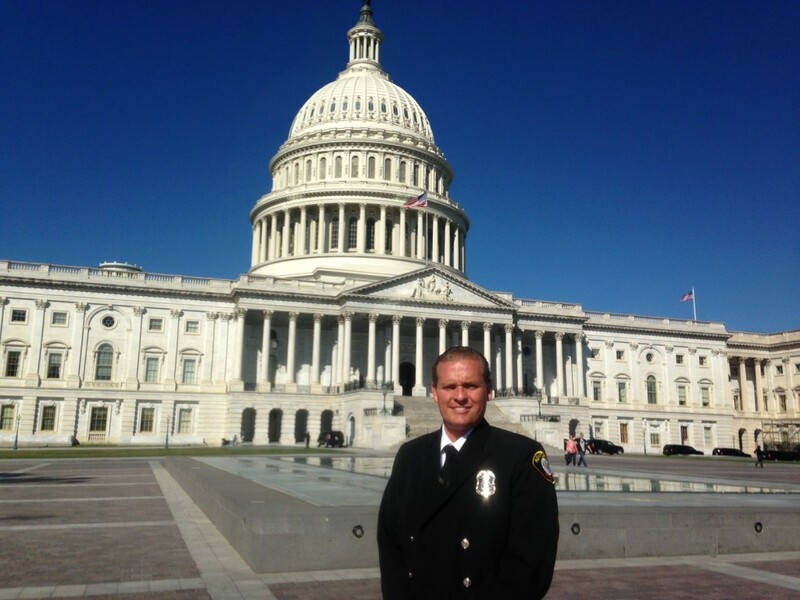 Matt Brisbois was honored in Washington D.C. in 2013 as a Champion for Change for his efforts through his role with CERT. The idea of training residents started when Los Angeles County Fire Department sent personnel to survey what happened after the deadly 1985 Mexico City 8.0 magnitude earthquake. They discovered that a number of the fatalities were residents who spontaneously volunteered to give assistance. 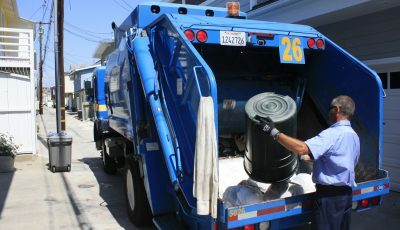 This prompted the L.A. officials to start a citizen training program to teach residents what they should, and shouldn’t, do following an unexpected emergency. The concept for the CERT program continued after the 1987 Whittier Narrows earthquake. The 5.9 magnitude quake resulted in eight related deaths and more than 200 injuries. It impacted thousands of homes, businesses and other buildings, and caused between $213 and $358 million in damages, according to the California Earthquake Authority. The 1987 earthquake highlighted the potential for a major disaster in the region, as well as the need to train residents to rely on themselves for immediate lifesaving and life sustaining needs. Closer to home, former Newport Beach Division Chief Randy Scheerer got involved with teaching residents how to deal with emergencies, Duncan recalled. They met in the community center in Newport Shores. “There wasn’t even a name for it,” Duncan said. Current NBFD Chief Chip Duncan teaching teaching a CERT class in 2000. Once FEMA adopted the CERT model and released curriculum and standardized lessons, the program really took off, Brisbois said. Huntington Beach was the first city in Orange County to start a program in 1991. Newport’s program was later modeled after its coastal neighbor’s, Brisbois explained. In 1998, Costa Mesa also started their CERT program. 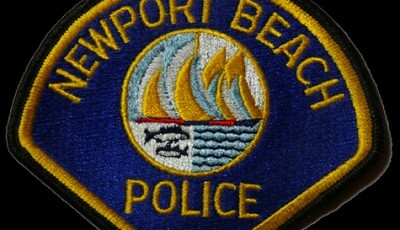 The first class in Newport Beach was in the community of Newport Shores in fall 1999. The program started in Newport Beach under the leadership of Donna Boston, now the director of Emergency Management for Orange County Sheriff’s Department. Jennifer Schulz and Katie Eing also managed the program before Brisbois took over. During the first several years, the training program taught volunteers the basics, like first aid and CPR, but it didn’t really expand further than the classroom. It was focused on training the individual to be prepared, but there was no concept of neighborhood management. “We didn’t really have an idea of what we wanted to do with the volunteers,” Brisbois said. When Brisbois took on the role, he sat down with then-Fire Chief Tim Riley and then-City Manager Home Bludau and worked out a plan regarding utilizing volunteers and what they want to accomplish with the program. They decided to take a “neighborhood by neighborhood” approach, Brisbois recalled. Current City Councilman Jeff Herdman was the president of the Balboa Island Improvement Association at the time and “took the bull by the horns,” Brisbois noted. The island group really supported the idea and made it their own. They wrote a neighborhood plan, they held meetings, worked with the local fire station, and more. The island is still one of the most prepared neighborhoods in Newport Beach, Brisbois commented. 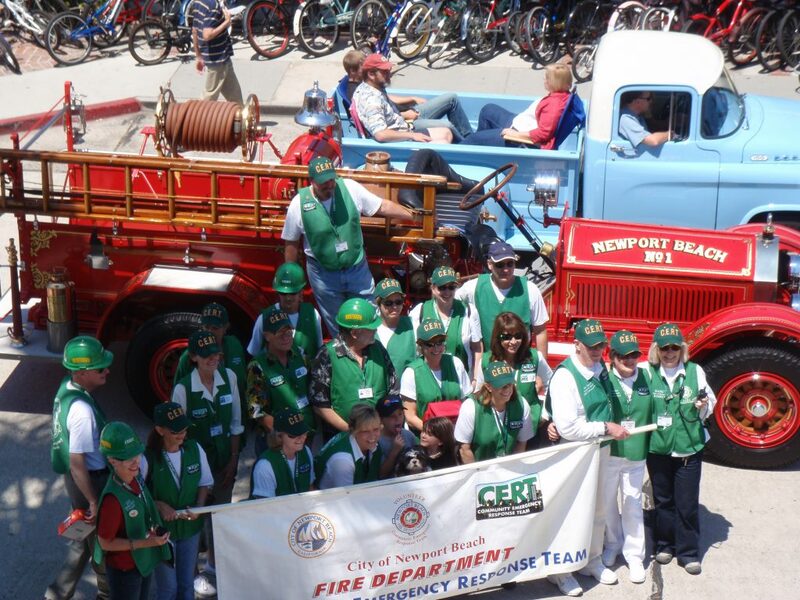 CERT volunteers at the Balboa Island Parade in 2009. The idea of “keeping up with the Jones’” really kicked in (in preparedness terms) after Balboa Island, Brisbois opined. Peninsula Point, Lido Island, and Bayside Village all followed shortly after. As well as this year’s NB CERT’s Neighborhood of the Year winner, Irvine Terrace, which is one of the most prepared communities in the country, Brisbois commented. “Our most organized neighborhoods have kind of emanated off of Balboa Island,” he noted. “I’m really proud, not just of what Newport Beach has done, but as a county I think we’ve really gone above and beyond,” Brisbois said. In 2005, there were only nine CERT programs in Orange County, now there are 34, including the OC courts system (the only courts system in the U.S. with a CERT program). 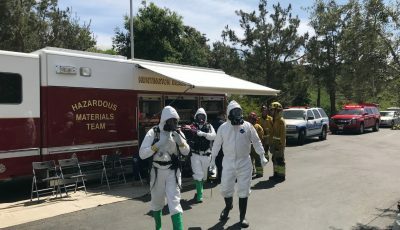 The OC is the only county in the U.S. that has a CERT Mutual Aid Program, or CMAP, a plan to coordinate county-wide that allows volunteers to cross jurisdictional boundaries and work together in case of an emergency. “Disasters don’t know city boundaries,” Brisbois said. CMAP was a “game changer,” Duncan added. It’s very a very unique program, and allows the CERT volunteers to be “force multipliers” and help other organizations, he added. 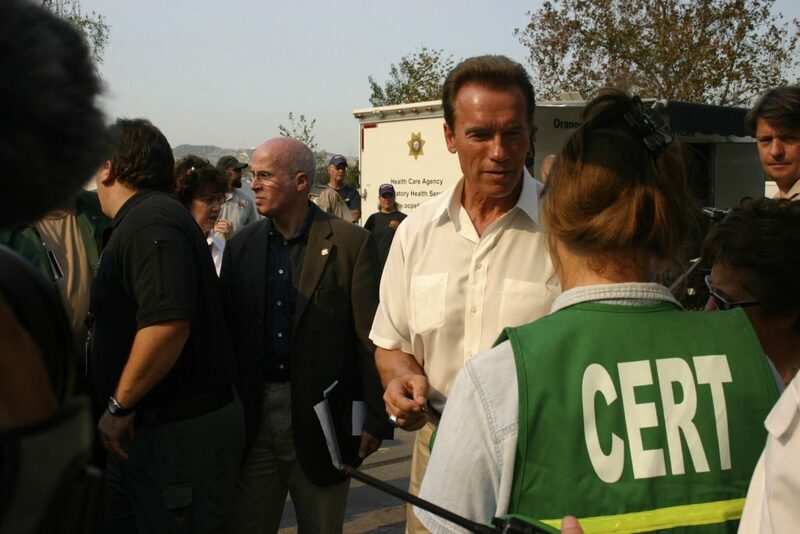 Cert volunteers talk with then-California Governor Arnold Schwarzenegger during the Santiago Canyon Fire in 2007. Helping neighbors, whether it’s individuals or nearby municipalities, in a time of need is what CERT is all about. In 2007, the Santiago Canyon Fire was the first major wildland fire in U.S. history that activated CERT volunteers. In 2008, they helped out on the Freeway Complex Fire. Both are great examples of how beneficial CMAP is regionally. “We had to come together to survive,” Brisbois said. More recently, and on a bigger scale, the state sent out an alert asking all 480 CERT programs in California for volunteers for a week-long assignment assisting in the cleanup of the catastrophic Camp Fire in Paradise. “That’s a really unique call,” Brisbois said, and indicates the importance of CERT volunteers. Newport Beach had one volunteer, Richard Eimers, head up to Butte County and take on the task. It was a very proud moment for the NB program, Brisbois added. Eimers will give a presentation on his experience at the library on March 4. 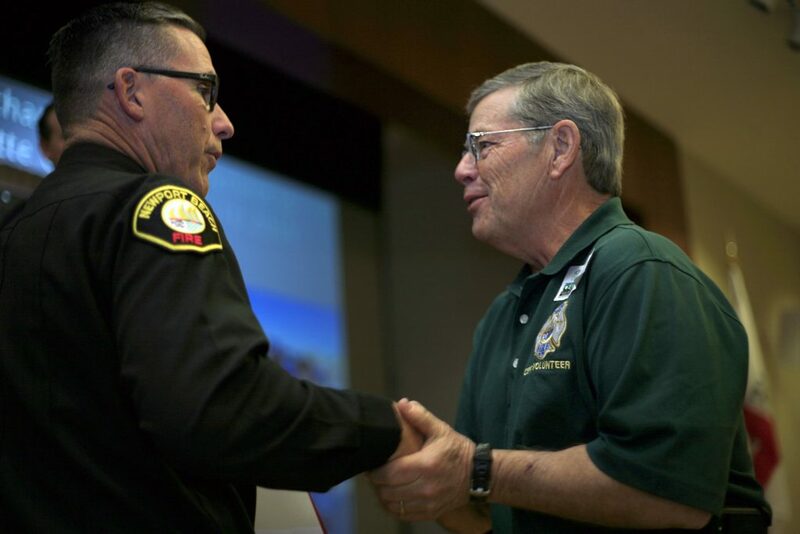 CERT volunteer Richard Eimers shakes hands with NBFD Chief Chip Duncan at the banquet. The only time CERT volunteers have been officially activated in Newport Beach was for the Ben Carlson paddle out and memorial services in 2014. About 60 volunteers were used to help organize and for logistical purposes. When Brisbois took over in 2006, there were 64 active CERT volunteers. Currently, there are 540 active volunteers. Duncan didn’t anticipate the program growing like it did in 20 years. It started small and quiet and then really exploded in the community, he said. “It kind of snuck up on all of us,” he commented. The current fire chief credited Brisbois for helping the program evolve over the years. “He took this and made it his own,” Duncan said. 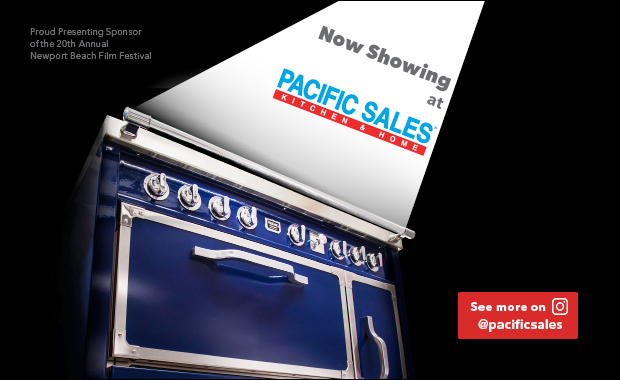 Newport Beach is widely recognized and has gained national attention, he pointed out. “Obviously we’re doing something right,” Duncan said. Many people are nervous about taking the course, Brisbois noted, but anybody can take the class and learn, regardless of age, experience, or physical limitations. “I truly believe it’s for everybody,” Brisbois said. 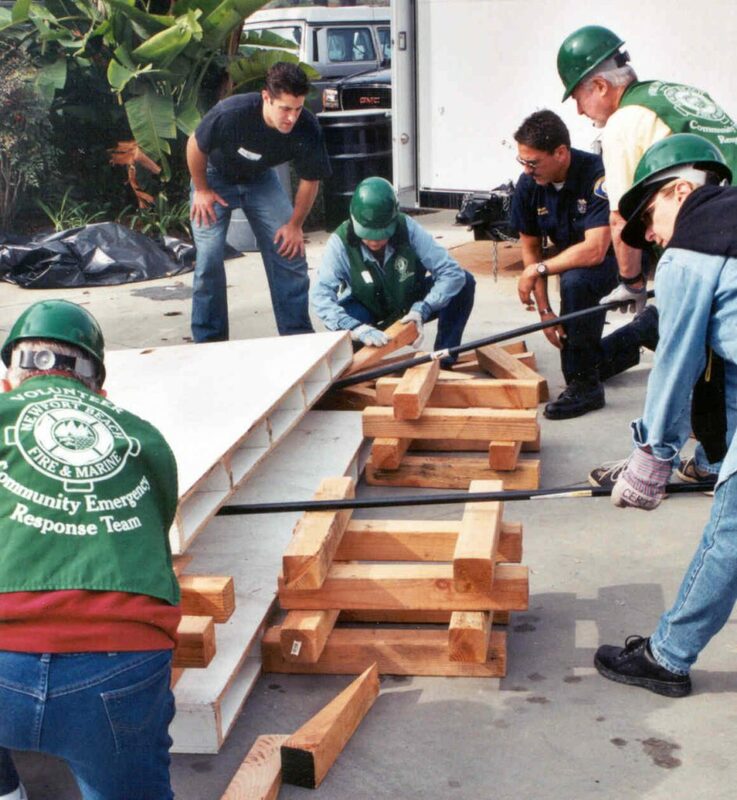 CERT volunteers work on “cribbing” to lift up heavy boards during training in 2001. The CERT program is all about empowering residents to feel comfortable with doing things like basic fire suppression or controlling bleeding. It’s up to the volunteer if they decide to take it a step further to check on their neighbor or organize their street, block, or community, he added. “The more people that are taken care of or checked upon the better off we’ll all be,” in the event of an emergency, Brisbois said. It’s grown past just training and preparedness, which is still the foundation of the program, Duncan said. “We’re always kind of evolving and changing,” Duncan said. 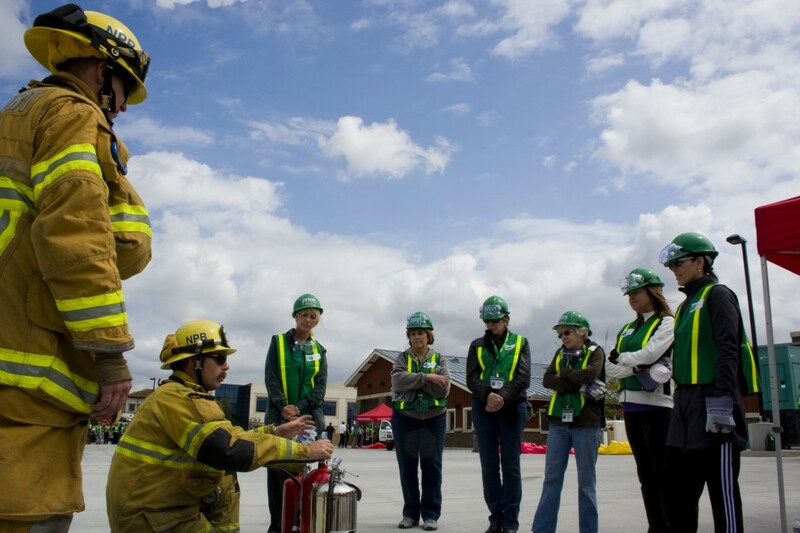 Now, another big part of the CERT program is public outreach and community engagement. CERT volunteers also attend about 100 events every year. Instead of the fire department pulling out engines and responders out of service, CERT volunteers can manage a booth and provide information, allowing the NBFD to attend, but stay on call. There is a lot of support from the city, community, and local businesses, Brisbois pointed out. Going forward, Brisbois hopes to incorporate online software for a volunteer portal. It would allow volunteers to enter their hours, see their training record, view volunteer opportunities and events, share CERT news, and more. It would help the program grow and more easily track total hours, he noted. He also anticipates social media becoming more of a focus, in terms of communication and sharing information during an emergency. The next 20 years the program will be more involved with the community, more visible and more engaged with the residents, Duncan said. He hopes to keep the momentum going, he added. Other awards on Wednesday included CERT Neighborhood of the Year to Irvine Terrace, Doak Hefner was presented with the Marilyn Broughton CERT Volunteer of the Year award, CERT Instructor of the Year went to Lifeguard Captain Mark Herman, Spirit of CERT Award to Darlene Covington, and School of the Year to Sage Hill School. The spring classes of CERT start soon and space is still available, the Thursday series begins on Feb. 7 and the Saturday group starts March 2. For more information, visit nbcert.org or call (949) 644-3112. NBFD Chief Chip Duncan at the banquet on Wednesday. 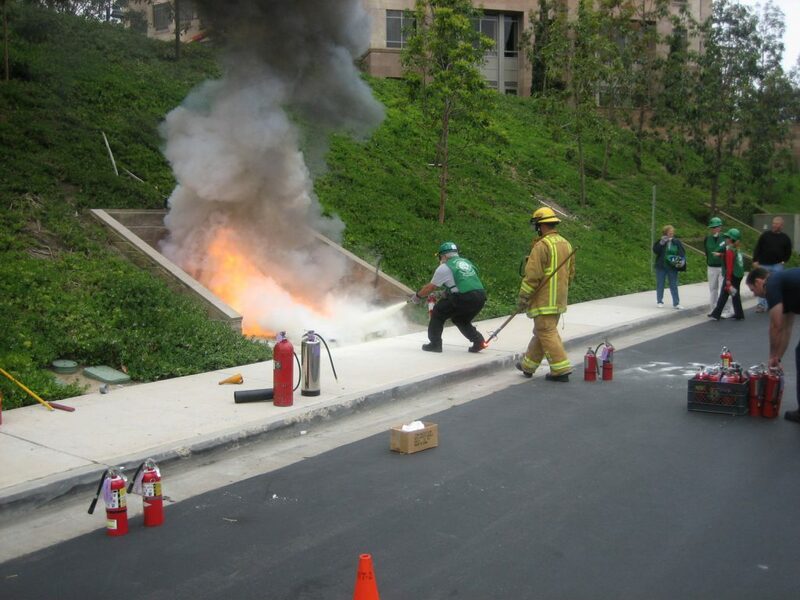 A CERT volunteer extinguishes a small fire near fire station #3 during training in 2006. CERT organizer Matt Brisbois teaching a class in May 2007. 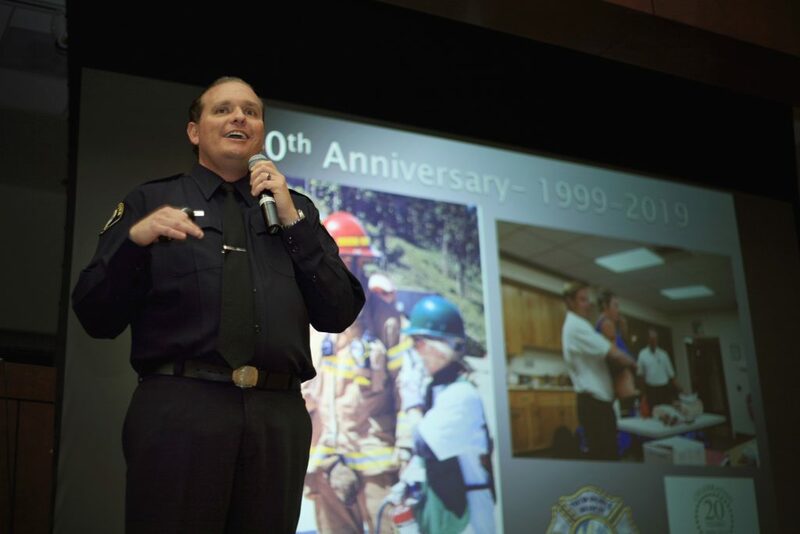 Life Safety Specialist and CERT leader, Matt Brisbois, speaks at the banquet on Wednesday. 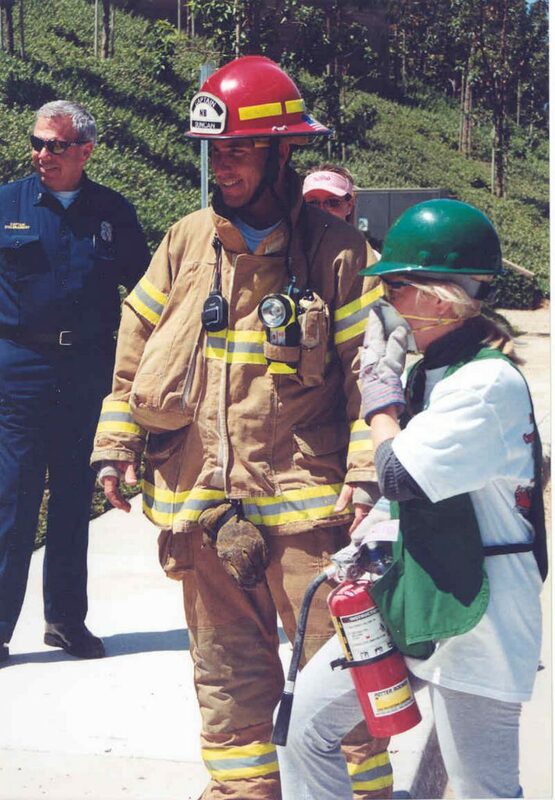 CERT responding to the Santiago Canyon Fire in 2007. 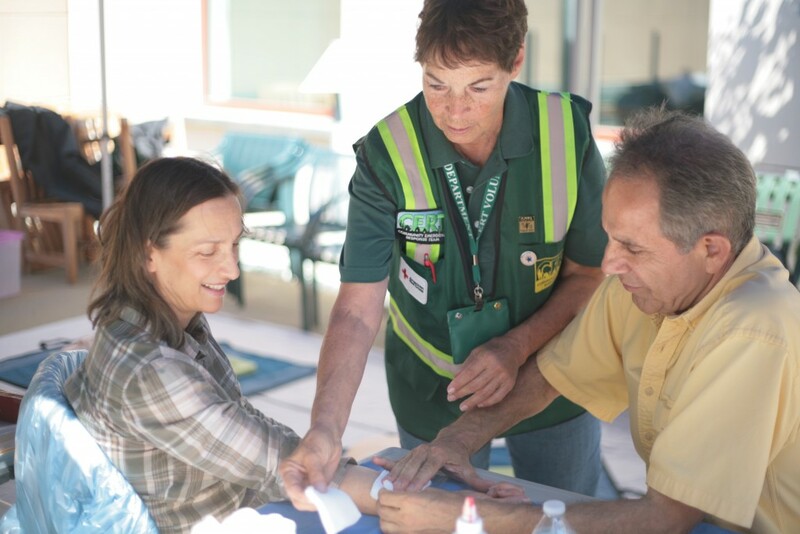 Newport Beach CERT volunteer Marilyn Broughton shows Newport Coast residents Faye and Ali Sadeghi some basic first aid skills during the 2014 Annual Disaster Preparedness Expo. 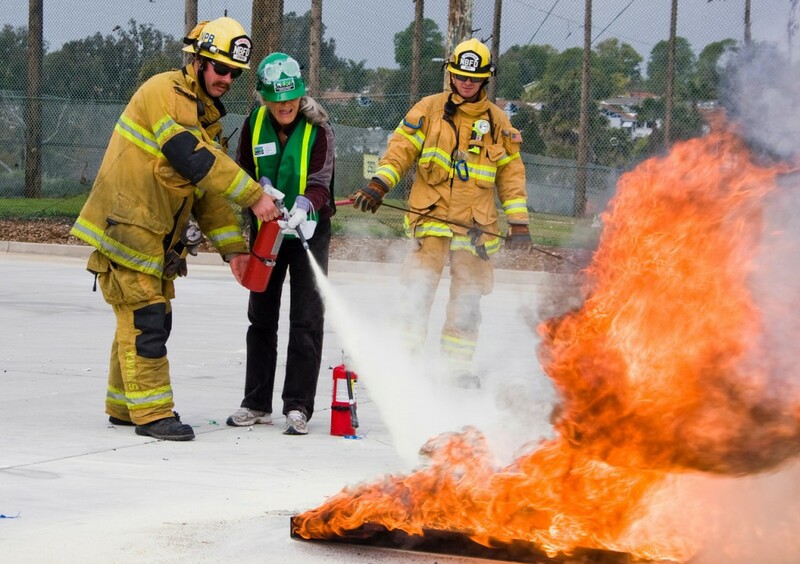 During a 2011 Community Emergency Response Team event, Newport Beach firefighter Jimmy Strack helps a CERT volunteer use a fire extinguisher to put out a fire as firefighter Adam Boyd watches from the background. 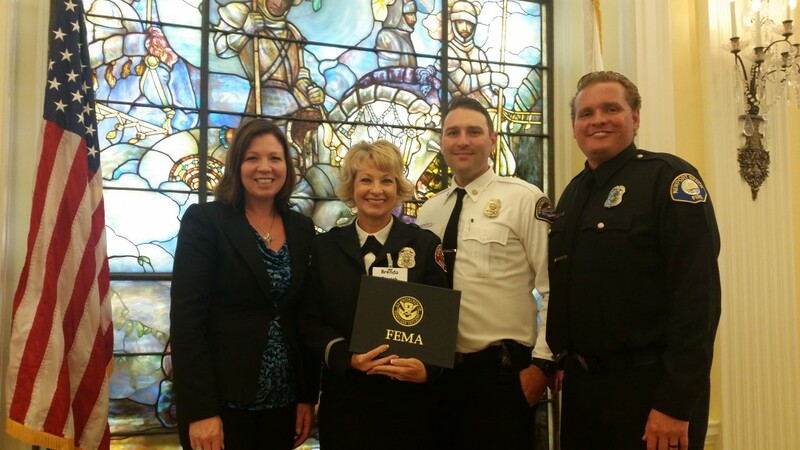 (from left to right) Donna Boston form the Orange County Operational Area, Brenda Emrick from Costa Mesa Fire Department, Brevyn Mettler from Huntington Beach FD, and Newport Beach CERT program leader and NBFD Life Safety Specialist Matt Brisbois in Washington DC accepting the 2015 FEMA Individual and Community Preparedness Award for Outstanding CERT Program Initiatives on behalf of Orange County CERT Mutual Aid Program. Newport Beach firefighter Jimmy Strack explains to CERT volunteers how to properly use a fire extinguisher at the fire suppression drill station as firefighter Adam Boyd listens during the 2012 Drill the Skills graduation event. Newport Beach firefighter John Kluve helps CERT volunteer Vicki Northcutt check on a volunteer acting as an injured person in the triage station during a Drill the Skills in 2012. CERT Volunteer Management Trailer that was purchased with a UASI grant in 2008. 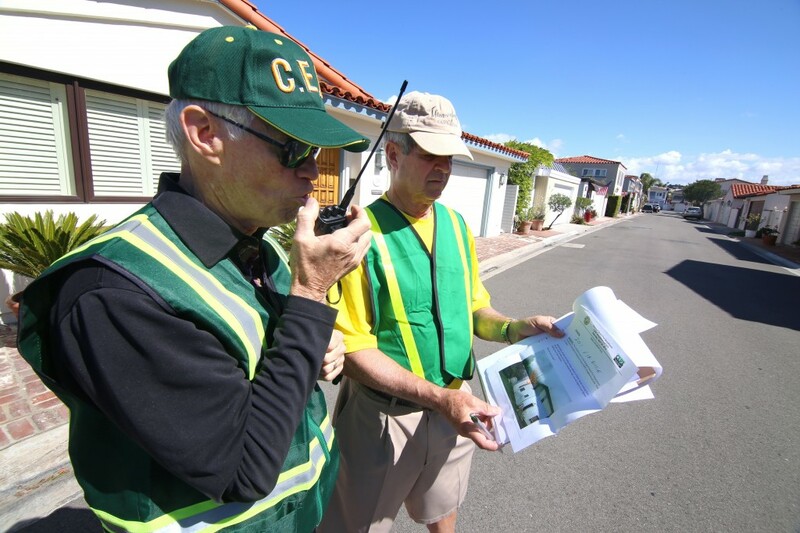 Lido Isle residents Dave Lamb (left) radios in the details of a hypothetical house fire as Hugh Helm checks the incident report during Newport Beach Fire Department’s first ever Community Emergency Response Team multi-neighborhood drill in 2014. 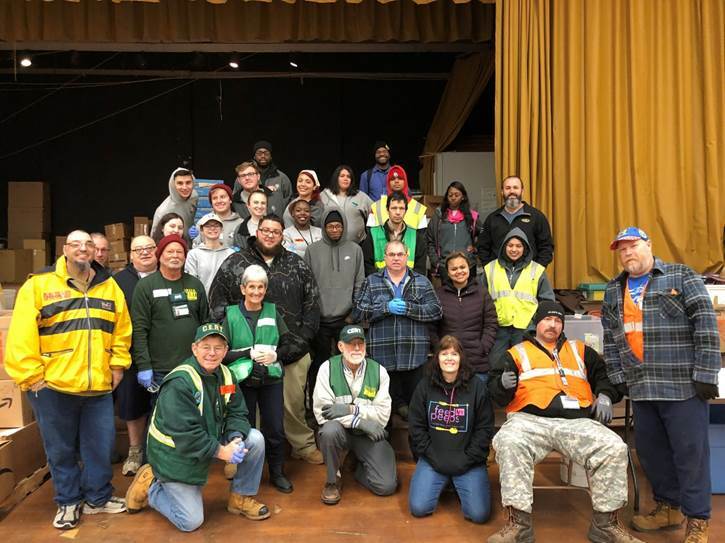 CERT volunteers from all over the state responded to the call for assistance in the cleanup of the Camp Fire in Paradise, including Newport Beach volunteer Richard Eimers (kneeling, bottom left).